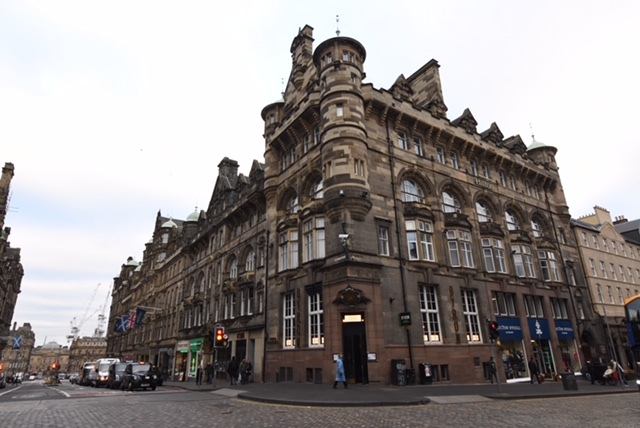 We arrived last night to the Old Town Chambers Apartments, located just off the Royal mile, with great views over the surrounding buildings to the lower Princess Street part of town. Many cranes in the distance are part of a new shopping and apartment complex being built. One can get an idea of the deep and steep alleys that run through this part of town. 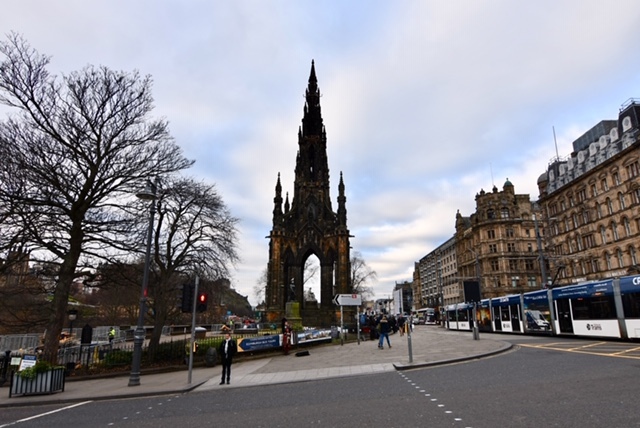 We had a late start to the day with breakfast at the Edinburgh Larder then took a stroll down Princess St looking at the monuments and statues while enjoying a good view of the castle and the grand buildings backing onto the Royal Mile. 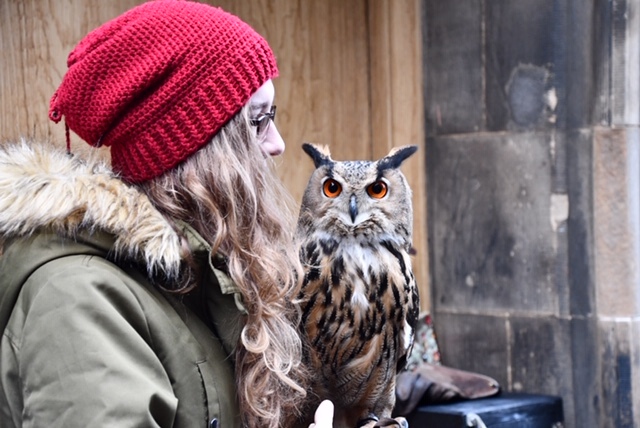 Back on the royal Mile we headed up to the castle, passing on the way a huge, stunning owl a chap had on display on the street. Interestingly there is a difference between a Scottish mile and an English mile. The latter is 1760 yards or about 1600 meters, whereas the Scots mile is 1948 yards or 1814 meters. Don’t worry – it was made obsolete around the 1700s. 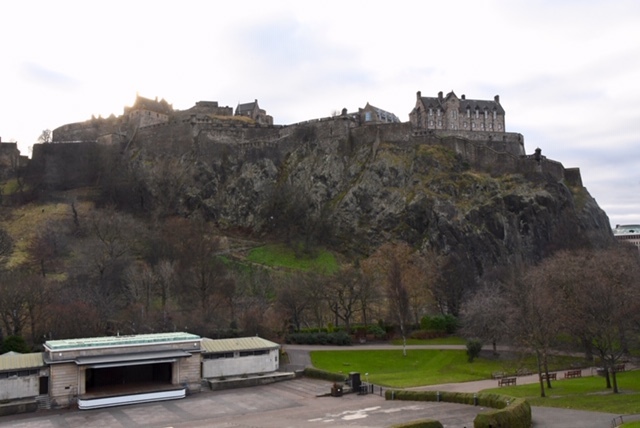 Edinburgh Castle is located on a volcanic plug or rock, which flows off down the Royal Mile. They reckon man has been hanging out here since 200 AD. 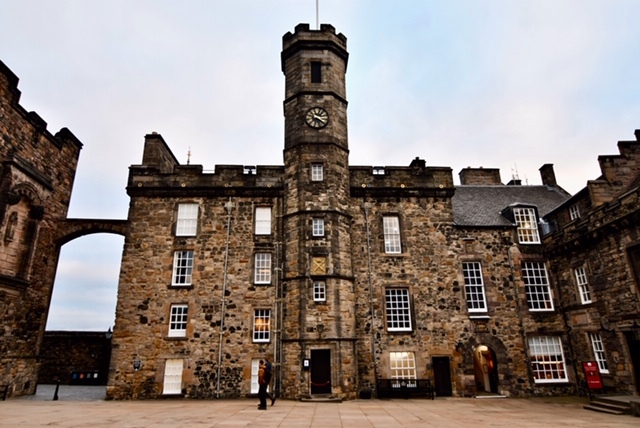 It appears that the first castle was established here by David the 1st around 1200 and it remained a royal residence until the 1500’s then becoming more of a military barracks. 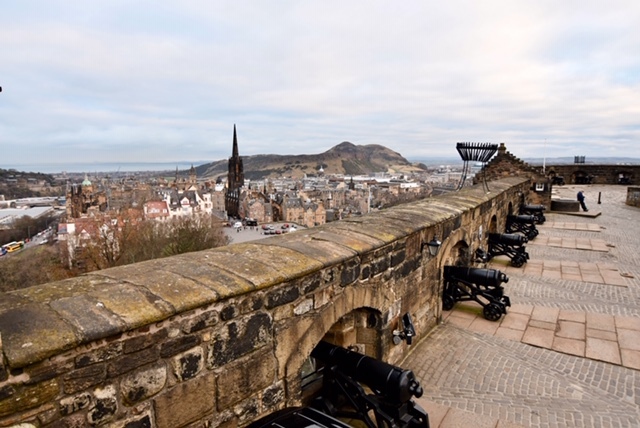 They say it has been under siege more times than any other castle in the UK. Like most of these buildings it has been rebuilt and redesigned many times. We headed in through the grand entrance and up to the terrace looking across the city to the harbour. Lined with canons it would have dominated the area in its day. 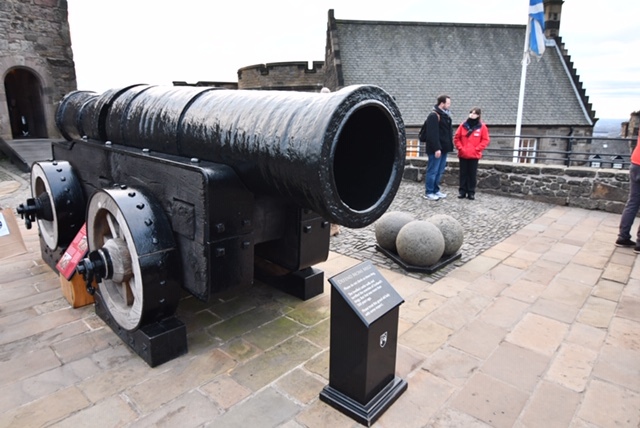 There is also a super large canon with big balls, which with lots of powder behind them would have wreaked havoc around the place. 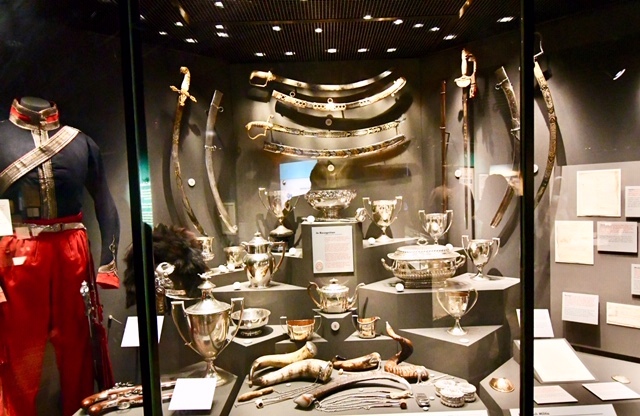 There is a good museum taking one through the history of Scotland. 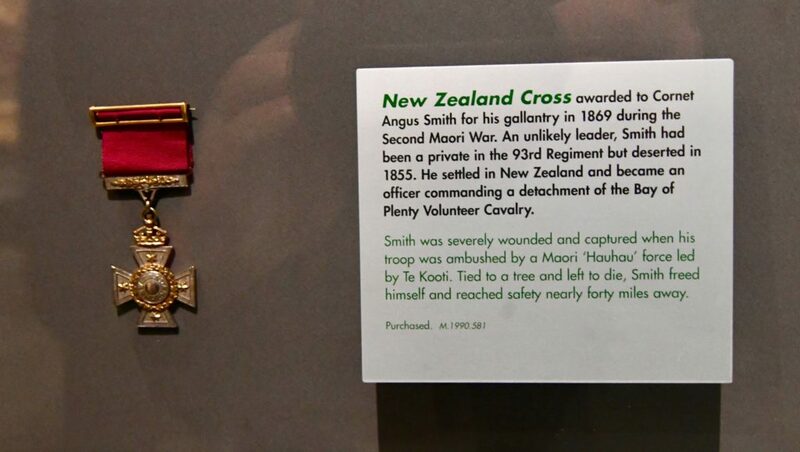 The Royal Scotts dragoon Guards also have a museum here which is well laid out and interestingly displays a NZ Cross awarded to one of its soldiers during the Maori wars in 1869. 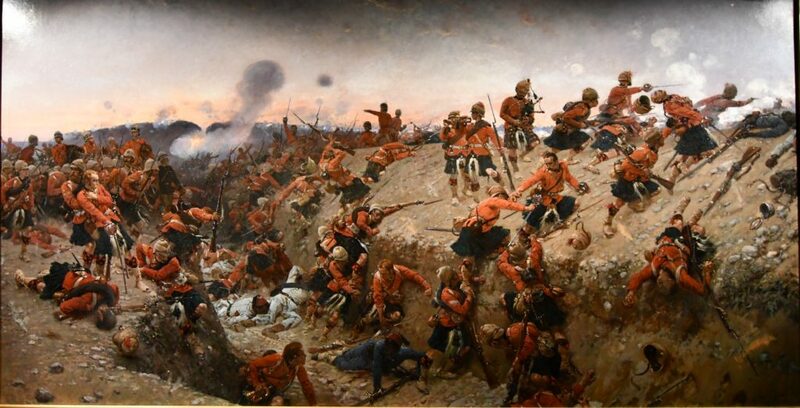 There is also a bloody painting on the wall, which displays a battle scene where guns are firing, swords swinging and bodies falling but the piper still plays. 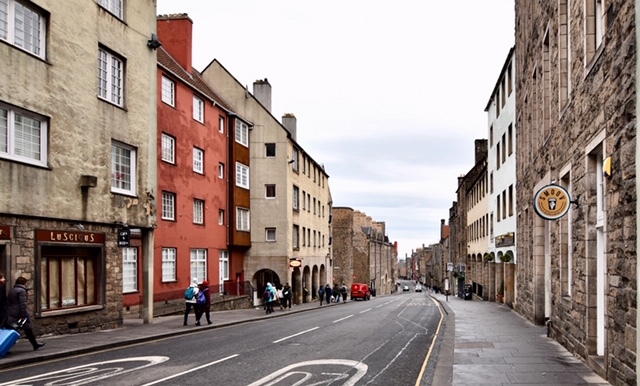 We wandered down the hill east along the Queen’s Mile. Luckily it’s winter so the place is not packed with tourists. The geology here is quite interesting. Formed by volcanic activity millions of years ago, the land runs down from the castle dropping away steeply to the north and south. 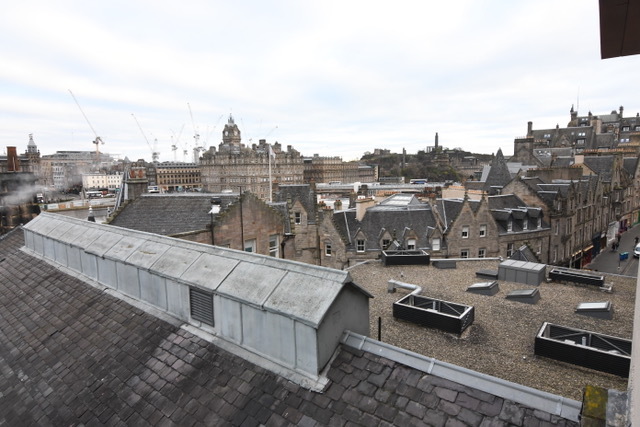 We turned south off the mile along Bank St and soon were on a bridge that had shops and restaurants on each side; they were however on the fourth storey of buildings built up from the land below. 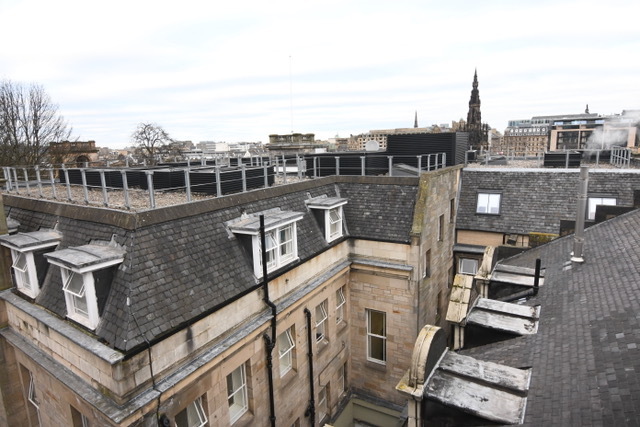 Every now and again there would be a gap in the buildings and one could look down on the streets and buildings below, very good use of space. We found a garden bar (with heater) and enjoyed a chat with a lovely young couple from Manchester over a G&T and cigar. We rose late and headed to the Southern Cross Cafe for breakfast. Sylvia always checks out these places online and goes to the one with a good write up. If I am on my own I just stroll into one that looks good from the outside. Sometimes the food is not quite up to the look! 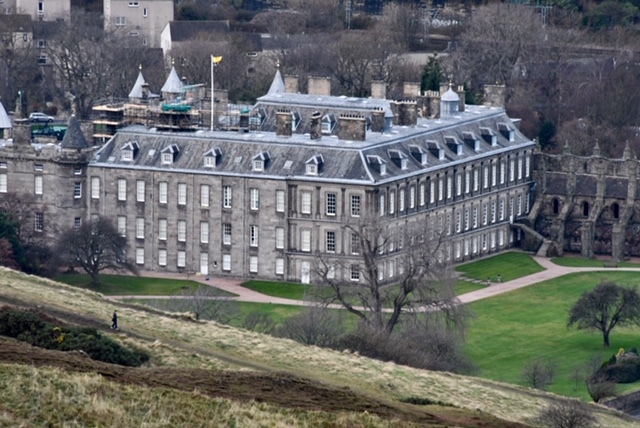 At the bottom of the mile is the Palace of Holyrood house, still the Queen’s official Scottish residence. It dates back to the 1600s with a derelict abbey dating back to 1128. It has lots of history as various people battled for power. Queen Anne of Scots was in residence there for some time before things got a bit tough for her and she took off to London to seek help from her cousin Queen Elizabeth I, but got a bit unpopular and was locked up in the Tower of London for years before losing her head. 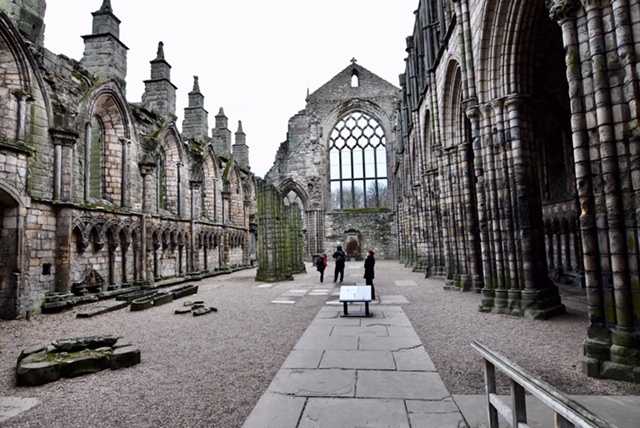 Over its history it has been shelled, torched and looted many times but apart from the abbey is well restored. 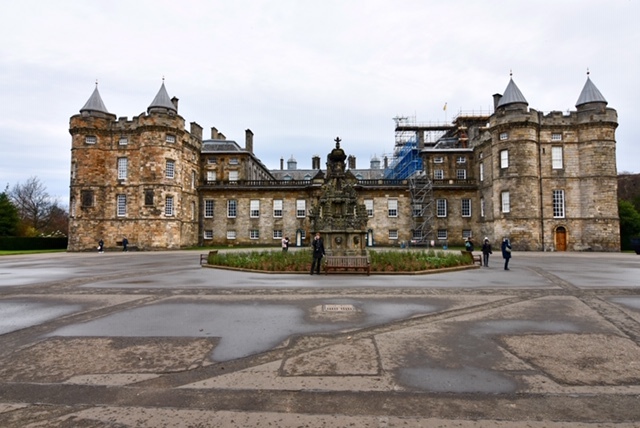 The palace is still a working palace where the Queen holds court, meetings, functions and presenting of decorations etc. 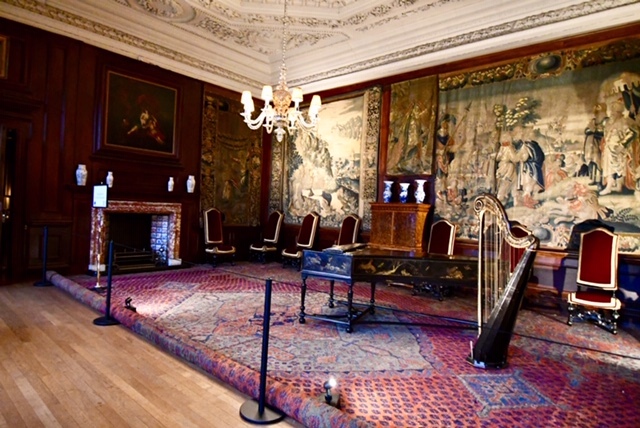 One gets to wander through the palace with its rather drab decor, much of it as it was decorated by various kings and queens over many years. 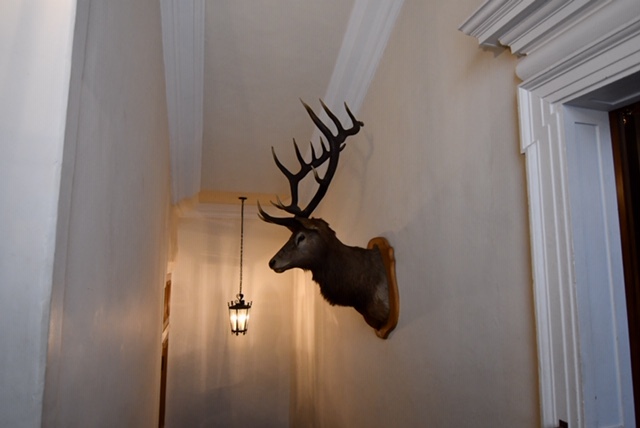 The royal family stay in an apartment upstairs when in residence that we did not get to see. They had a no photo policy which Sylvia pointed out to me after I raised the camera. One wing on the castle was built as a fort and has walls 2m thick. Leaving the palace we headed out the back onto Holyrood Park, which is a small hill or volcanic plug (probably considered a mountain here). 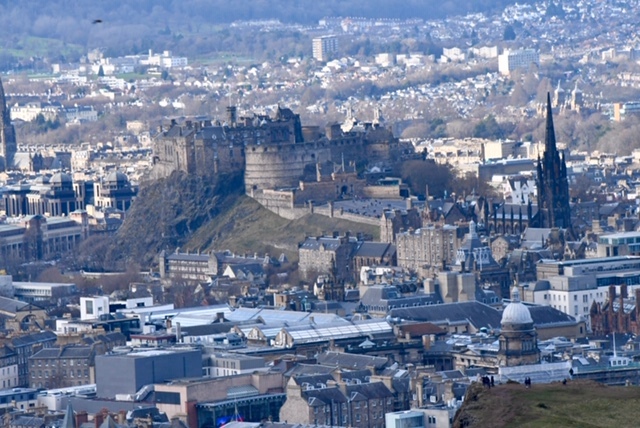 We followed the path and hundreds of people up to the rocky top, known as Arthur’s Seat, well worth the walk as we had great views over the city from the top. 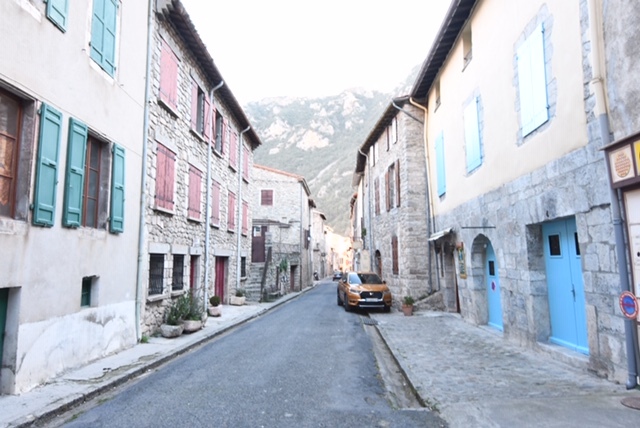 By the time we strolled back into town the day was nearly over and the light fading. We headed back to the garden bar stopping to check out Greyfriars Graveyard, a cemetery famous for a wee dog that sat on its owner’s grave for years after his death. At the bar three local woman were celebrating a night out, one originally from Tutukaka New Zealand. They were a great bunch with whom we had a lot of laughs before heading to check out the old and now underground city. 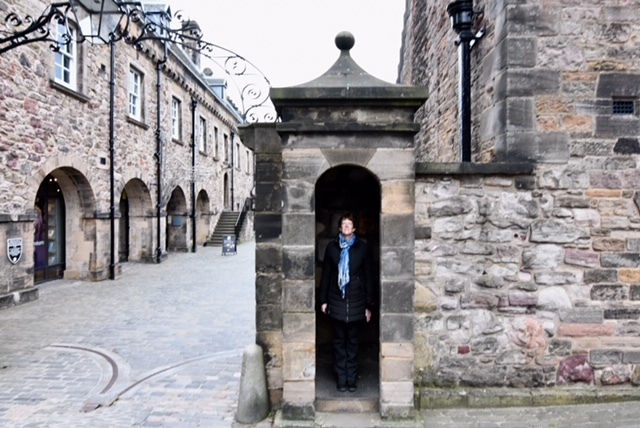 The Mary King’s Close tour is well worth doing and winds its way through a variety of old buildings that have survived being built over. Way back people lived in these almost dungeons through plagues and poverty, many housing there animals in the the small caverns. Sewerage was simply emptied onto the steep alleys several times a day hoping rain would wash it down into the local gully. 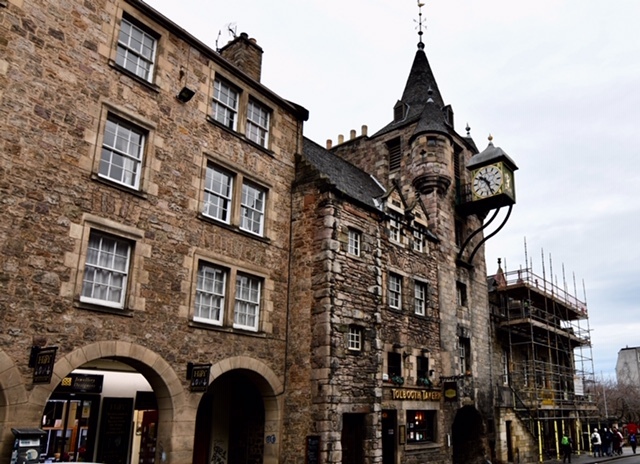 Apart from the upper storey these were built of stone; the upper wooden storeys were often destroyed by fire so were not a popular place to live. The tour guide did really well in taking us back to these times. 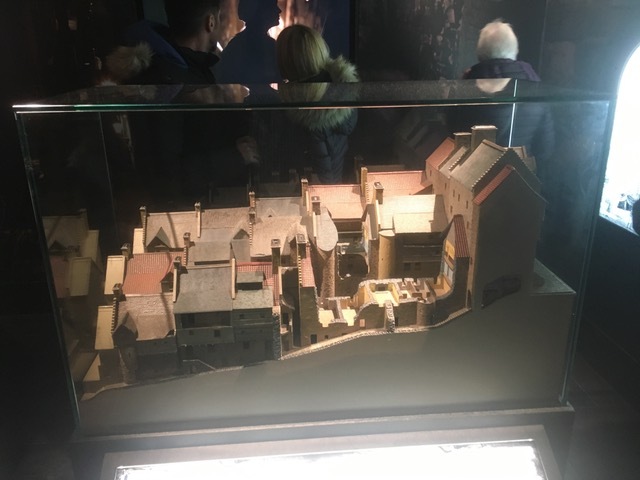 A model of the old city which went down 8 stories. 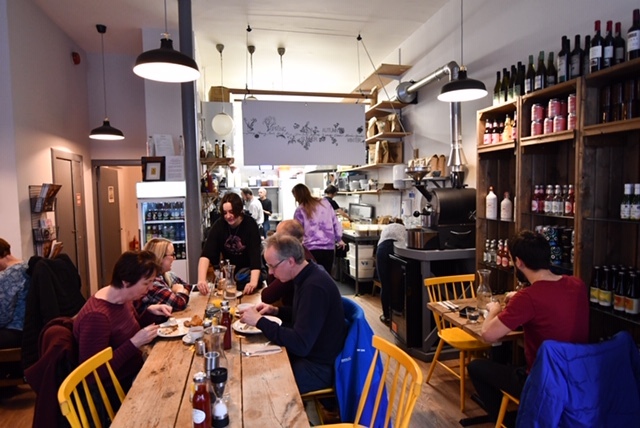 We had dinner at Zizzi, an Italian restaurant next to were we were staying, which is quite big but the service excellent and the food great. After breakfast we headed to the airport for our flight to Marseille. Air France, not our favourite airline, had emailed and asked if we could check our carry-on bags through as the flight was really full. We only travel with carry on so we don’t lose out luggage but we decided to check our bags to help them out. The flight went through Paris to Marseille. As you have no doubt guessed by now my bag, along with those of a lot of other passengers, didn’t turn up. In all fairness it did get delivered to our Hotel in Montpellier the next day. Sounds like you are both having amazing travel, Scotland has so much history and, such beautiful architecture. Makes me want to get up and go ????. 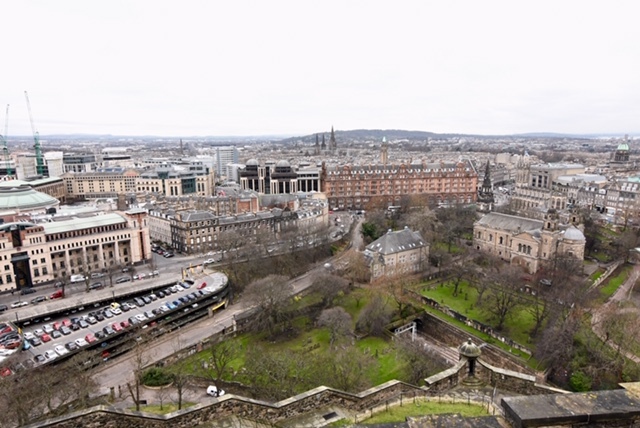 We did the underground tour in Edinburgh, there was a whole city down there. Luke reckoned he saw a boy (ghost) and had to be taken outside, pale and sweating! Surprised not to see snow there, but you obviously hit the city when a milder spell had kicked in! It is a beautiful and historical city.